Of course, we can get your business to rank better in the search engines and to show up in Google Maps, but we go a step further by making sure that your website converts visitors to customers. It starts with SEO (Search Engine Optimization) but it ends with CRO (Conversion Rate Optimization). With Search Engine Optimization (SEO) your site will rank highly in Google search results. Potential customers use and trust Google every day, and if your business isn’t on the first page, then you are missing out. Very few people go to page two of the search results so you need to dominate page one. Your website is your silent salesman and, like any salesman, the close is the most important part of the process. It doesn’t matter how many visitors you get if they don’t buy. We optimize your site to improve conversions. SEO will deliver increased traffic to your website and that will be followed by more inquiries for your product or service. Those inquiries will turn into a steady flow of new customers, increasing your revenue; often by 5x or more. Our objective is not just to get you to feature on the first page of search engine results but, by optimizing your website both on-page and off-page and utilizing social media and links from authority websites, you will control numerous entries on the first page. This will drive a targeted audience of buyers with money in hand to your website, wanting your products or services. There is no point in just sending traffic to your site: it has to be targeted traffic – people willing and able to buy. If you are ready to start making more money now: call us at (540) 324-9649, or go to the next step. We help businesses to get more business from the Internet by helping them to set up a marketing plan and then work to make it successful. With a background combining business consultancy and traditional marketing with digital marketing expertise we as able to advise on all aspects of business improvement. Having a website is only the first step, as you have probably seen. If people can’t see the site, it might as well not exist. The job of Virginia SEO Expert is to make sure that your website shows up when people search for the services you sell. Back this up with a site designed to convert visitors to buyers and you win every time! Get up-to-date tips, techniques, and ideas delivered to your inbox. We only send a couple of bulletins a month, so you won't be overwhelmed - but you will get some great ideas for improving your business. With more than 10 years helping businesses to prosper, we have the experience and skills to make sure that you get the results you want: and that means more revenue and profit, not just better rankings. We are so confident that we will GUARANTEE the results. 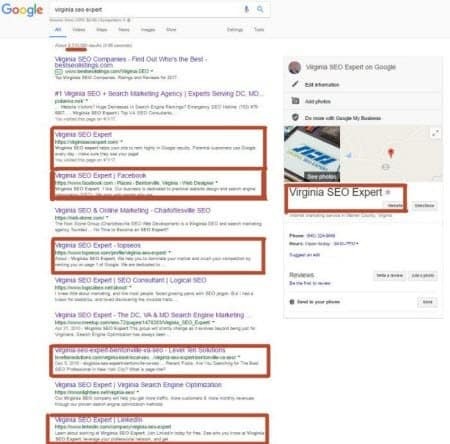 A few reasons why you should work with Virginia SEO Expert. We are a premier Internet Marketing Service company in the State of Virginia. We are Google Advanced Analytics certified. We design or redesign websites to ensure they convert. We are based in Virginia but have clients across the globe. We GUARANTEE that we will improve your search engine rankings.